The last 3 downturns in the stock market started in April 2010, April 2011 and in April 2012 — currently, valuations are elevated, profit margins are at all-time highs and there are signs of investor complacency everywhere. March 28, 2013 — the S&P 500 just made a triple top on low volume — Very Bearish! Here are 17 reasons the stock market will crash in 2013! 1. Much of the recent frenzy of stock buying has been boosted by borrowed money. Margin levels are rising fast. 2. Earnings growth expectations are tumbling. And earnings are the most important drivers of stocks. 3. Profit margins are already at record highs, and analysts expect them to go higher. Profit margins tend to be “mean-reverting” — meaning that they don’t stay at record levels (high or low) for long. So many analysts think a margin correction is coming. 4. Stocks are expensive relative to 10-year average earnings. This ratio, popularized by Robert Shiller, is above 22, which is much higher than the long-term average of 15. 5. US stocks specifically have been outpacing the rest of the world during the last three years. Such out-performance also tends to revert to the mean. 6. Based on the forward price-earnings ratio, the S&P 500 is one of the most expensive markets in the world. 7. And based on Robert Shiller’s price-earnings ratio, the US has one of the most expensive stock markets in the world. 8. Much has been made about a “Great Rotation” of funds into the stock market — but history shows that these fund flows actually lag stock market performance. 9. Investor sentiment by most measures is already extraordinarily high, which is often a warning sign. When everyone’s bullish, it is often a sign that there’s no one left to buy. 10. According to Citibank — investors are almost “euphoric” with the stock market’s performance. 11. The volatility index, aka the “Fear Index” is near a historic low, which reflects investor complacency. 12. Trading volumes are historically low. This suggests that new buyers may be scarce. 13. Gasoline prices have been rising rapidly. Stocks often sell off when gas hits these levels, because high gas prices tend to slow economic growth. 14. The stock market’s most famous cheerleader, Thomas Lee of J.P. Morgan just turned bearish! JP Morgan’s Tom Lee has a reputation for being bullish no matter what. Last year, he was dead right about what stocks would do. Now he is “Looking for Better Entry Point Around 1400-1450 on the S&P 500” — Lee thinks it’s best to watch from the sidelines for now. 15. NYU economist Nouriel Roubini, who predicted the last financial crisis, has maintained an incredibly bearish stance on the economy for years, especially considering the Fed’s ultra-easy monetary policy. Ironically, the world’s most famous doomsayer is bullish. 16. The last two times stocks hit current levels, they collapsed. Now that they have recouped their losses, there are plenty of investors who would be happy to dump stocks and book profits. 17. James Altucher thinks we could see Dow 20,000 easily in 2014 or early 2015. Agreed — “The Only Money in the Economy is the Fed Printing Money” and you “Don’t want to fight the Fed” but the party is going to end in 2013 and stocks will collapse then. 18. Enrollment in social safety-net benefits is supposed to move in sync with expansions and contractions in the economy. The food stamps benefit has soared 70% since 2008, to a record 47.8 million participants as of December 2012. 19. The “U6” — the best measure of real unemployment — now stands at 14.3 percent, six points or more above what it was before Wall Street crashed the economy in 2007-2008. 20. Since 2006, M3 is no longer tracked by the US central bank — why hide this data — Hmmm. 21. Supply of ammunition at many gun stores is running low for anyone who wants to buy it. But not for the government as there’s a bullet buying spree going on right now by the Department of Homeland Security. Can you say “Martial Law” because of an impending “Economic Collapse” coming to the United States. 22. ObamaCare — This is how Tyranies begin, Socialism starts and Liberties are lost! 23. We all shop for food, put gas in our cars, pay for medication and doctor’s visits, day care and college — and based on those prices, inflation has got to be higher than what the government says. The Consumer Price Indicator registered a puny 1.7 percent in 2012, according to official figures. Real inflation is in fact higher than that, according to the American Institute for Economic Research’s (AIER) Everyday Price Index, which in 2012 revealed almost 8 percent inflation, much higher than the official CPI. I personally (family of 1) spend $72.00 on a Comcast Internet connection (no cable television), $70.00 for healthcare and dental, $65.00 for electric, $25.00 for trash, water and sewer, $82.00 for auto insurance, $775.00 for rent, $300 for food, $150 for gasoline, $16.00 for Netflix, $35.00 for Virgin Mobile cell phone, no car payment, no mortgage, no credit cards per month — total of $1590.00 per month with a take-home pay of $1700.00 every other week including my 20% 401k deduction already taken out. Luckily, I have lived comfortable during this economic crisis. A person I know with (family of 5) have $1800.00 mortgage, $400 for healthcare and dental, $190 for a healthcare reimbursement account, $200 for electric, $150.00 for trash, water and sewer, $335.00 for auto insurance, $285.00 for cell phone, $135.00 on a Comcast Internet and cable with $800.00 for food — total of $4295.00 per month taking home $4100 per month including their 6% 401k deduction — how do they survive? They have no car payments or credit cards either. Tell me what you think — did I miss something and how is your family surviving in this low inflationary environment according to the Federal Reserve? 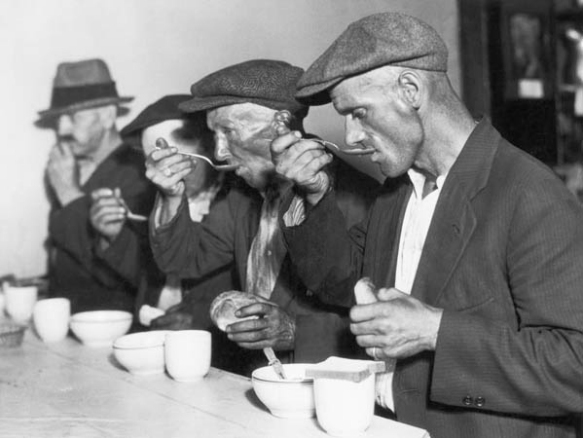 How are you surviving this “Great Depression” we are living in? Are you making it on your take-home pay? People I know are not paying all of their bills — I guess that is how they are making it. Stocks Have hit New Highs in 2013 — Time for a Market Crash?